This is my entry for the #gbjam 2015, made in roughtly 12 hours. Francisco de Goya, a spanish painter, knew his people really well! And so he reflected it in his painting “Duelo a Garrotazos – Fight with Cudgels” from 1820: we spaniards tend to argue and fight instead of debating. 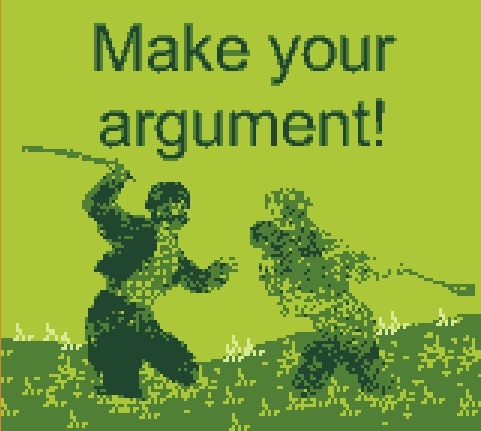 I though it’d be funny to use this painting as a base for a reaction game disguised as an “debate simulator”. I wanted to add the 2 players option, each one controlling one of the characters, but I wan out of time.